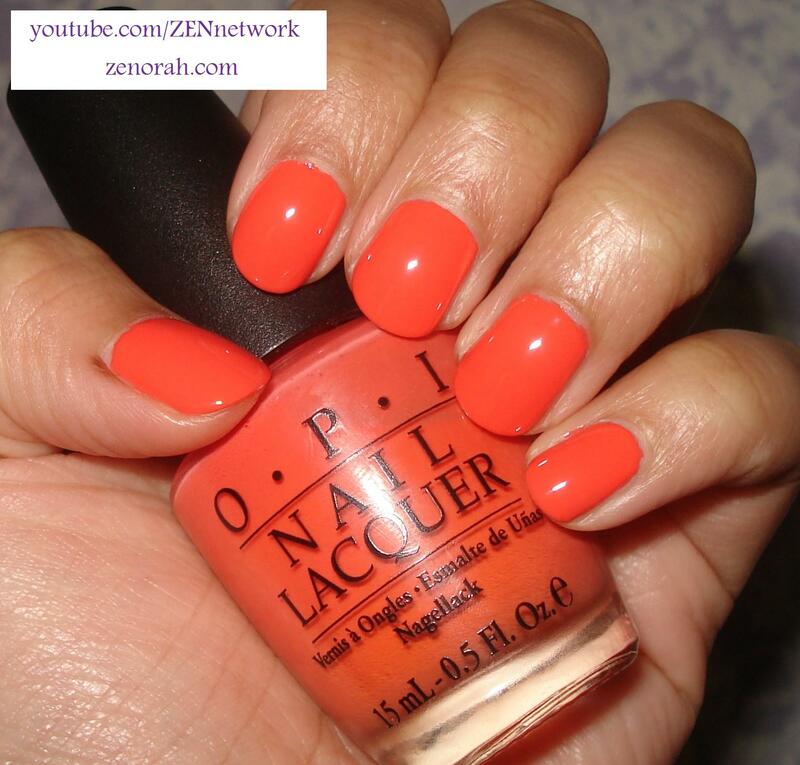 OPI Hot & Spicy – is hot tangerine coral creme polish. This polish brings back soooo many memories of Summer 2010 – it was released in the Hong Kong Spring & Summer 2010 Collection and I have been addicted ever since! I can’t tell you how many times I have worn this polish over the years, I’m actually really surprised I haven’t used the entire bottle as of yet. Luckily for me and all the ladies who loves this colour – OPI recognized a good thing when they saw it and made this polish a part of their permanent line up, so do not fear ladies you can definitely find this beauty in your local beauty store. I should add, I have a huge affinity for coral shades maybe because I consider it my ‘lazy’ colour – meaning I like everything with it! But when a coral shade is done right – that just makes my day so this polish is everything I have ever wanted into one. Mind you, I have a TON of other corals some more red, pink, yellow etc BUT this baby just always takes the cake. So in essence – it is the PERFECT coral shade for my skin tone. My search is over and I am trilled about that – as is my wallet! lol. I am currently going through my stash to film my all time favourite top 25 nail polishes (for the last 2 years of course because lets face it, my mind will change with time) and I have to say, this is one of them! I honestly can not see this looking bad on anyone! And if wearing bright polishes as a manicure isn’t your thing then, your toes will rejoice with this as a pedicure colour! I think it’s stunning and looks really gorgeous with a variety of outfits and in my eyes, I consider a very confident nail polish. Sort of – hey look at me, that’s right I’m Hot & Spicy lol! The application was good, OPI to their credit has some of the fastest drying nail polishes I have ever had and this is no exception. What you are viewing is three coats of polishes because the formula is a little runny and thin but I happen to like that because as I layer on the thin coats, it does dry quickly. The wear time was great as well but seeing as my nails are shorter than usual I didn’t see tip for quite a number of days. This is not normal for me because as much as I love OPI polishes, it always gives me tip wear literally I kid you not, THE NEXT DAY! So having shorter nails did change things up a bit but like I said, I’m totally in love with the colour and the wear time was pretty decent (not Essie standards but still pretty decent). I honestly think it’s a summer staple and you will thoroughly enjoy it in your collection! Do you own OPI Hot & Spicy? What are your thoughts on this nail polish? You are so right about this one. Bought it when it first came out, wore it once-I was indifferent. I recently tried it again and was so mad at myself for not wearing it more. This is “thee” coral for me. its just perfect. I adore this polish soooo much – I am really excited to do my all time favourite polishes video. you’ll see some amazing polishes in that video. But I haven’t decided if I should do a top 10 of each brand…kinda confused, let me know what you think. And oohhh yeah this is my perfect coral as well – I took it offn recently and i have been wanting to wear it again. Love your taste in polish!